I've been enjoying my Olympus E-P1 and forgetting that I needed to come back here and finish my review -- in any case this is more a usage report than any sort of formal test. There are enough full coverage reviews available from the big sites. While I like reading them to get some sort of a general idea about a camera, they almost always forget to mention those aspects of usage that are most important to me. Rather than this feature or that sensor improvement, I am most often concerned with the usability of the camera day-to-day and second-to-second. The pertinent question is always: Does this gear support my activity as a photographer? Perhaps today is a good day to reconsider this camera, since Olympus has announced three new Micro Four Thirds (MFT) bodies and Panasonic has already made available their latest incarnation. 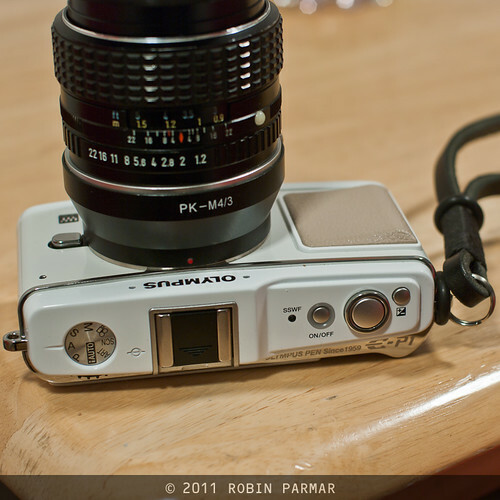 The Olympus E-P3 is the natural descendent of the E-P1 I have in front of me. Since I am unlikely to get that unit for review, instead I will write up my take on its predecessor. Then I will see how many of the issues with the E-P1 are corrected in the E-P3. I will remind readers that I bought into the Olympus PEN system to meet three requirements that were not supplied by my Pentax DSLR system. First, the camera is significantly smaller in overall size. Second, it can use my supply of lenses, so I save on additional purchases. In fact, lenses made for just about any mount in the history of photography can be grafted onto the MFT bodies, due to their short registration distance. Third, the E-P1 does not look like a "serious" camera and might attract less attention when travelling and street shooting. Besides these advantages of MFT cameras, there were further general constraints on I placed on choosing a system. I wished to maintain the availability of In-Body Image Stabilisation (IBIS), since this allows one to take sharp shots in adverse light situations. The final image quality must overall not be significantly diminished from what I was used to. Manual focus must be supported and easy to use. Small lenses must be available, in order to leverage the size of the body -- no point using gigantic lenses as this cancels one of the main benefits. Finally, the cost of the body must be reasonable. 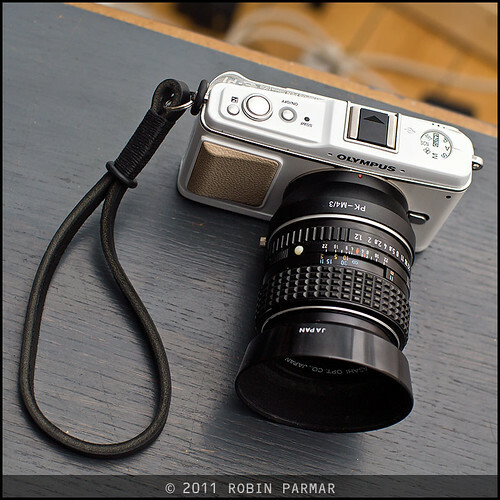 All of these constraints were met by the Olympus PEN E-P1, especially that of cost, since the model is old enough that some real bargain can be found. This is a direct result of the fact that most users chase the newest features and models without consideration for photographic improvements. I note in passing that the Panasonic MFT cameras, while in some significant ways superior, do not have IBIS and look like mini-DSLRs. In this way they miss out on two of my main criteria. Finally, I must mention that the mirrorless camera market presents many alternatives to MFT, including the Sony NEX, Samsung NX100 and Fuji X100. For one reason or another none of these meets my needs, but they might work well for you. Overall I was impressed out of the box with the solid build of the E-P1. This seems like a camera that can take a few knocks, far from the plastic demeanour of most point-and-shoot cameras, and better, even, than entry-level Canon and Nikon bodies. The small front grip and rear protrusion provide something to hold onto, although this is insufficient. There is no reason why the front grip couldn't have been larger, since even if it protruded significantly it would still be behind the plane of any attached lens. This is one place in which aesthetics seems to have trumped ergonomics. The top controls are straightforward. Unfortunately the Olympus uses a button for On/Off instead of the superior slider or switch which cannot be accidentally activated. (Panasonic got this right.) I would also prefer the EV compensation button to be not so close to the shutter button. There is plenty of space to make these changes. The body provides no grip or consideration for the left hand. This is typical but still unfortunate. When using a manual focus lens your left hand will be supporting the lens itself, ready for action. But when using an auto-focus lens the left hand has nothing to do (changing modes not being a constant activity). I would love to see a camera with a second control wheel on the left, so that one could instantly adjust two photographic parameters (say, ISO and EV compensation) while using an automatic lens. Or how about using this dial to change aperture? That way, one could use the dial for automatic lenses and the lens ring on manual lenses. Either way the left hand is performing the same function. All of the back-side controls are on the right-hand-side of the screen. This means they are packed a bit too tightly. From a usability perspective one might define two classes of buttons: those one uses while shooting (photographic parameters) and those one does not (control parameters). I would be happy to see the control parameter buttons (menu, trash, play, info) moved closer to the screen (there is room) and away from the photographic parameters. In particular the AL lock button is placed with the control parameter buttons and far away from convenient use while shooting. Along with the aforementioned scroll wheel is a second control dial. This has been implemented as a rotary controller, like on the back of Canon DSLRs. This is always a poor choice. Controlling rotation when the camera is held in different positions is always gong to be harder than controlling a linear dial. And this problem is only exacerbated by putting four additional click controls on the rosette (with a fifth in the middle). That's a dense configuration of different controls. Perhaps I should clarify this critique to forestall certain expected comments I will get from Olympus fans. Certainly one can use all of these controls quite handily, once learned. But there is still significant room for improvement in each area. When shooting in the field the opportunity to press the wrong button or have settings change "by themselves" should be minimised. Unfortunately these have been common complaints of observant users. I'd rather think less about the camera and more about my shot. To conclude this section I note that the memory card and battery are in the same compartment. The door and latch seem quite plastic in build, but work well enough. Unfortunately, you can't access this compartment when using a tripod. I would not be the first person to note that the Olympus menu is confusing in its organisation. The first level of menus has five options though one of these must be turned on elsewhere or it remains invisible. Four of these categories gives access to a list of setting. But one of them, the Gears menu, instead has eight further sub-categories. I see no reason to have a three-deep hierarchy here. All twelve categories could simply be available off the bat, with the most used ones first in line. Furthermore, the grouping of options is quite poor. For example, several aspects of the display are set under the Spanner menu, not the Display menu, which instead also concerns connectivity. Confusing. A good deal of customisation is provided. Besides many control tweaks, both the Fn button and left direction in the rosette can be re-defined, though choices are somewhat limited. 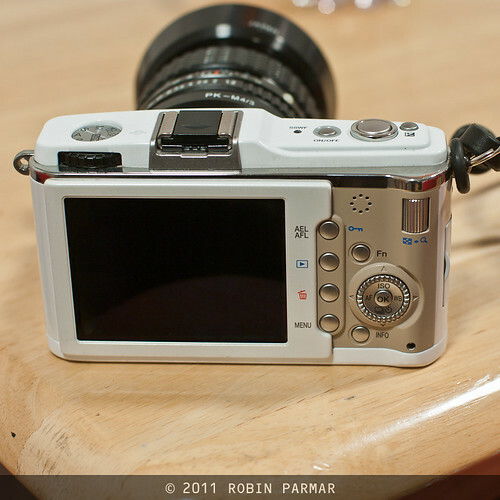 One cannot create a user menu with this camera. In addition, the system for saving user settings is quite obscure. The biggest issue here is that despite all the options, Olympus seems blind to the fact that there are three main exposure parameters: shutter speed, aperture and ISO. The first two may be freely assigned to different controls. But neither the thumb scroll or the wheel controller can be set to ISO. Neither can one map the Fn button to ISO -- a major oversight. The most direct way to set ISO is to press the top rosette button. Alternatively, one can press "OK" to get into a menu system. If you preset this to ISO then access to this parameter is fast. Thus one has no fewer than three ways to change the ISO value. So why complain? Well, this would be well and good except that all of these methods use the rosette. 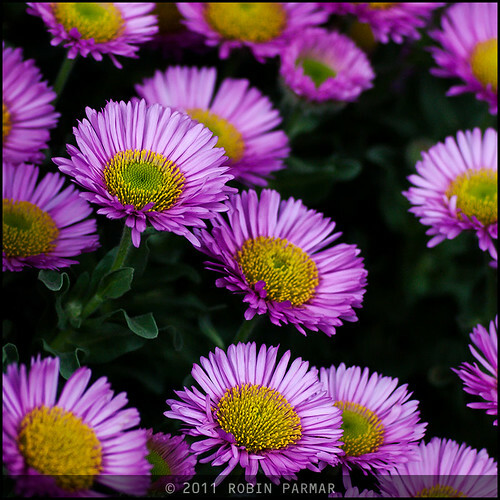 This use conflicts with the display setting used for manual focus lenses. In this special mode a green focus rectangle is placed on the screen. Pressing "OK" magnifies this for fine focus. Pressing the rosette buttons moves it about the screen. The upshot is that when using a manual lens there is no way to directly access ISO at all! Instead, get this: One has to click Info to change the display mode, click one of the keys to access ISO, change this value, click another key to return to the display, then tap Info to get back to the manual focus screen. Finally click OK to magnify the focus zone. What a ridiculous system! This is so massive a usability issue that I am stunned Olympus haven't issued a firmware fix. The simplest solution is to allow assignment of ISO to the Fn button. And it's not that firmware hasn't been updated; the current version is 1.04 and significant changes have been made. Olympus simply seems to not care about this matter. While I am discussing the software interface I must remark on the problem of not knowing what a button will do in a given mode. Info cycles between several different possible views on the LCD. (I am thankful that you can customise which of these are active.) If you hit OK you go into a horizontal-vertical menu system that works rather well for quick selection of a parameter. However, at this point I expect the Info button to drop out of this menu and continue cycling through display modes as before. But instead it takes on a new function and provides us with yet another view of the same menu options, this time in a grid. I find it annoying that once in the settings menu I need to remember the Info button has changed its usual function. And I really don't think we need this many ways to change the camera options! That's only a minor annoyance next to the ISO control issue, but every minor issue makes the camera that little bit less usable. This review will continue in part three. He he. Yeah, it makes no sense from the perspective of keeping the camera small. But it does balance surprisingly well in the hands and takes fantastic pictures!